Ahoy! Here we were once more. What is this, year six or seven or so of the TieTracker™? We love doing it. And last time it was fun breaking into women’s fashion, even if we didn’t break much new sartorial ground. 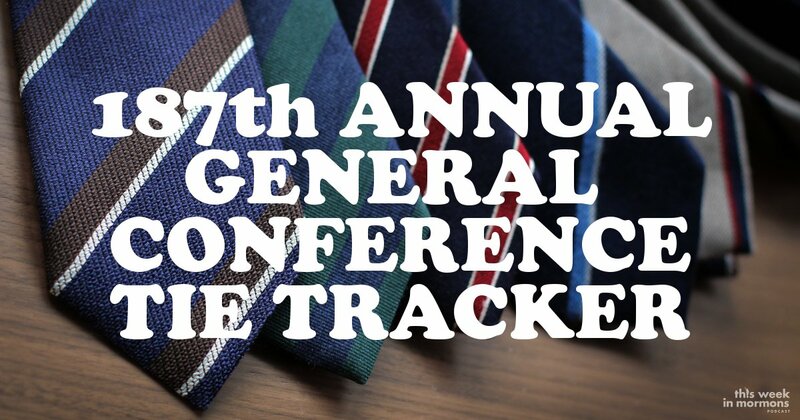 For those of you new to this process, we track the tie colors and patterns throughout General Conference, and we also do a jacket+blouse and necklace analysis of the female speakers. 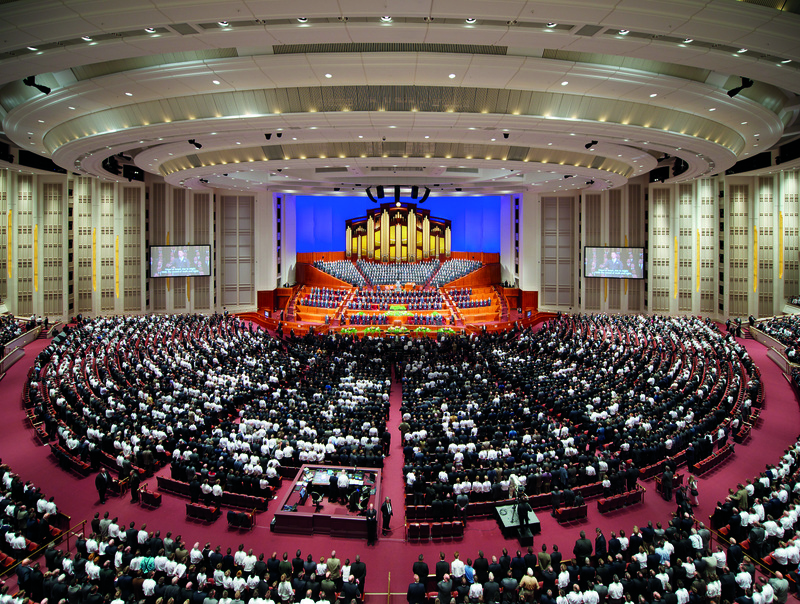 Ground rules: speakers and conductors are fair game, but we don’t include those who pray or MoTab. 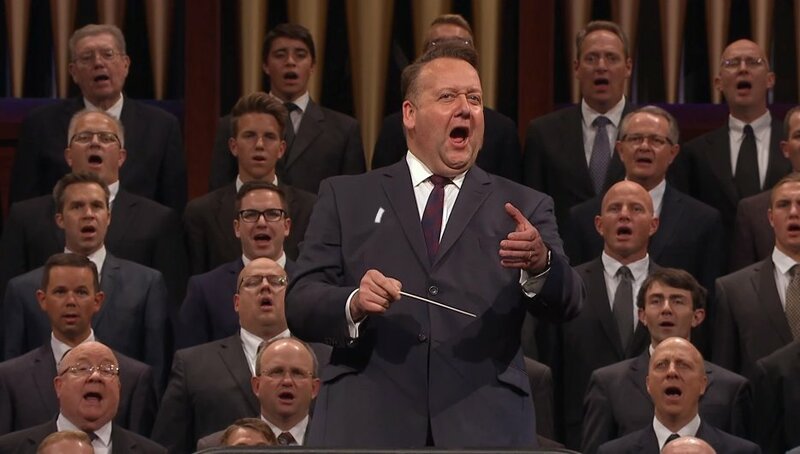 If we counted MoTab we’d have 150 blue muumuus to account for. 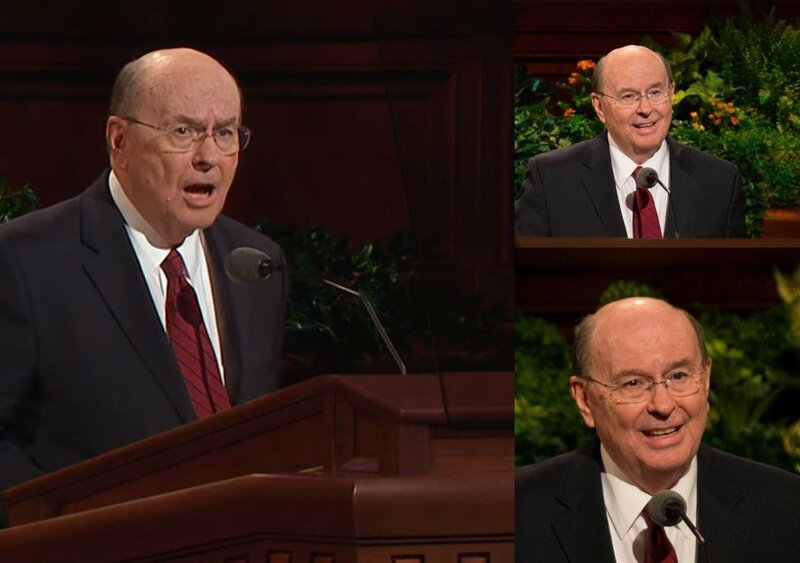 We’re saddened to learn of the passing of Elder Robert D. Hales. He passed away shortly after the Sunday morning session ended. He was 85. 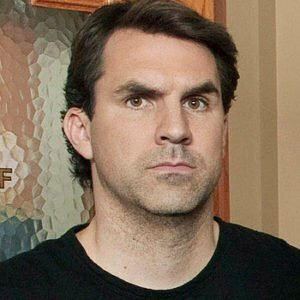 He wrote one of our favorite books, Return. We encourage you to read it. Blue hung on until the end, but its share decreased from a high over over 50% to a reasonably 35%. This was mostly thanks to a late-game surge of gold, purple, red, and green. That roadshows of Seventies during the middle of the session can really turn things around. 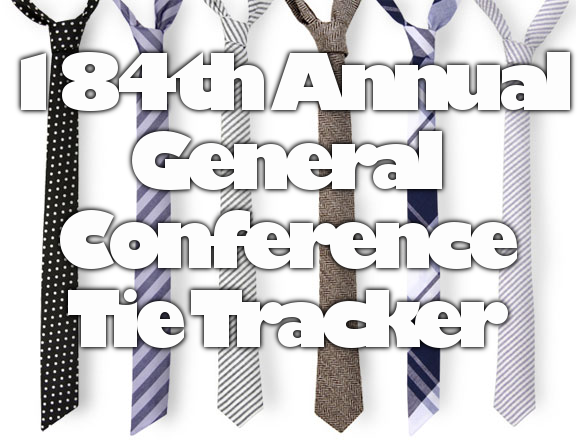 Likewise, striped ties killed it this #ldsconf, as they often do. But it was more of a runaway this time. We haven’t seen a paisley tie for some time, but they do pop up every few years. We encourage future conference speakers to seriously consider rocking more audacious neckwear and also to embrace broad-collar shirts. 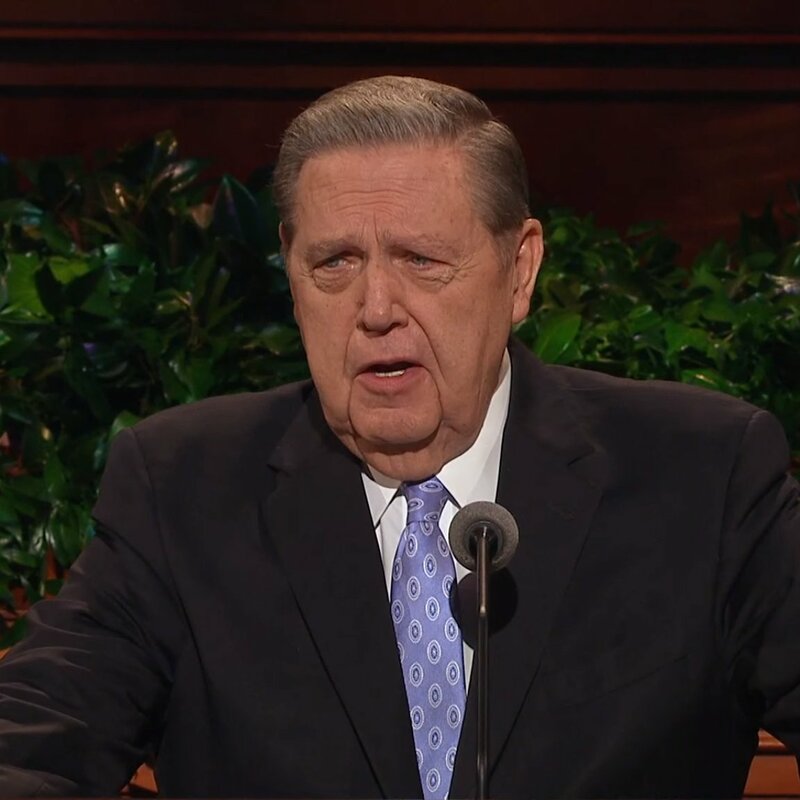 Green got some love thanks to Elder Bednar’s sort-of-solid-sort-of-patterned tie. 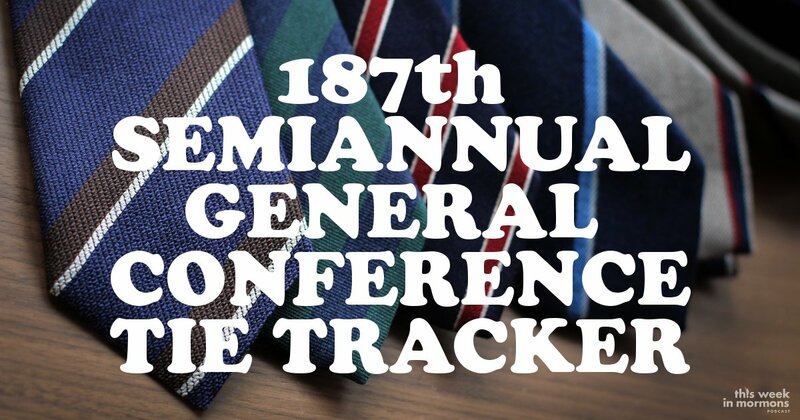 Either way, someone had to be the bulwark against Blue, which has been marauding all over this conference and currently has over 40% of displayed tie color. Stripes maintain a 60% design share. That’s down a smidgen since the priesthood session, but nothing dramatic. And on the sisters’ front, Jean B. Bingham looked straight-up classy in her grey coat. President Uchtdorf graced us with his multi-color striped tie. It’s mostly blue, but there’s also purple, pink, yellow, and silver in it. This is an awful screencap, but so be it. Other than that, nothing too crazy. Stripes are absolutely obliterating all other styles to a much grander extent than normal. Still no paisley. We did, however, love Elder Evans’ interesting patterned tie. OK, first off, Elder Ronald A. Rasband totally rocked some fierce pinstripes. That’s not tie-related, but it deserves a slow clap. 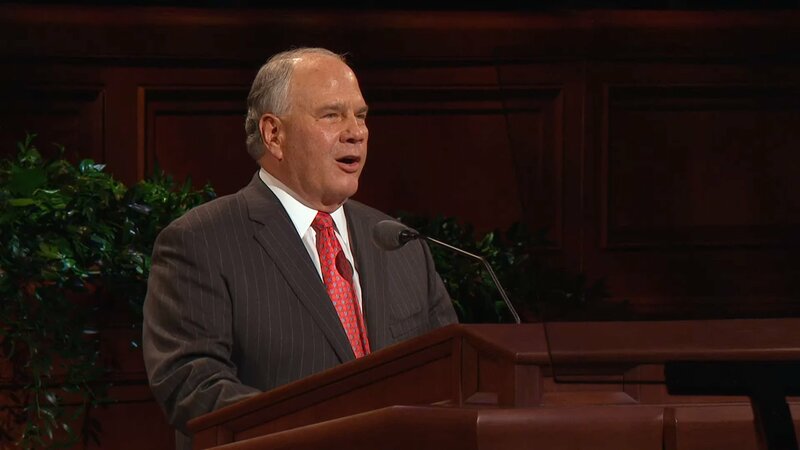 Alright, Elder Rasband’s tie was also something special. It was hard to pin down its exact color. It was gorgeous. Alright, red ties have actually overtaken blue ones, thanks to the reliability of Quentin L. Cook, who has worn the same striped red tie for the past three conferences. Striped ties are running away with things. Paisley! We need a paisley! No major surprises here. 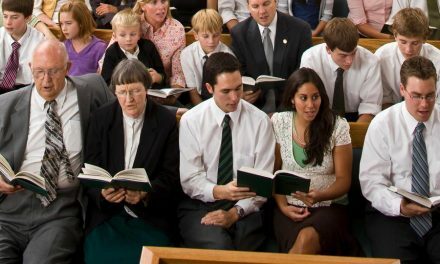 Blue dominated when it comes to colors, but green did surprisingly well, thanks to what must be a new tie from President Uchtdorf. Other than that, many stripes were shown and feelings were felt. Passive voice was also used, but to a less extent than it normally is. We had some fun and floral prints in this meeting, but don’t worry, all of them were undone by weird women’s blazers that no one other than female Mormon leaders and missionaries would ever wear. The blazer lives on! How about the Sister Eubank, eh? Incredible talk. Igualmente for Sister Marriott. And Sister Jones. Amazing stuff. Oh, but fashion. Sister Jones was the best. That was something out of Blade Runner. 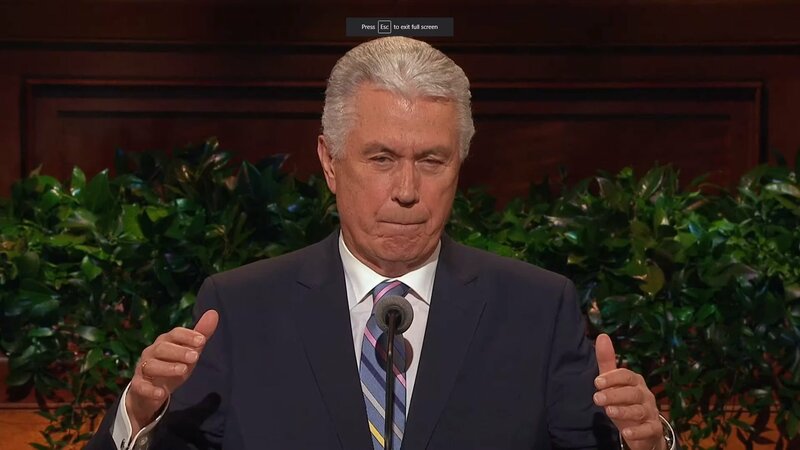 President Uchtdorf brought out a heretofore unseen tie, a seemingly solid red winner that actually appeared to have both a subtle pattern AND stripes. Leave it to a Silver Fox.